Nursing and horticulture students will have access to new advanced study areas at Federation University’s Wimmera Campus following major refurbishments. Improvements to the Nursing teaching space will provide students with a new five-bed nursing suite, nursing labs and store room. Horticulture students also will be able to pursue their studies in a new modern hothouse constructed at the campus. 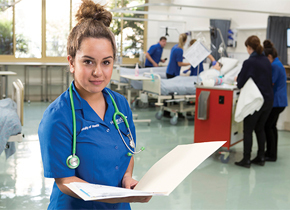 The developments coincide with strong enrolments at the Wimmera Campus for Nursing. Fifty new Diploma of Nursing students have enrolled to bring the total number to 75. There also are 25 new students enrolled in the Certificate III in Individual Support program. In addition, 15 new students have enrolled in the Certificate III in Horticulture program.